Since my 1st Instructable i've not got enough likes. so, I thought Of making a new instructable. 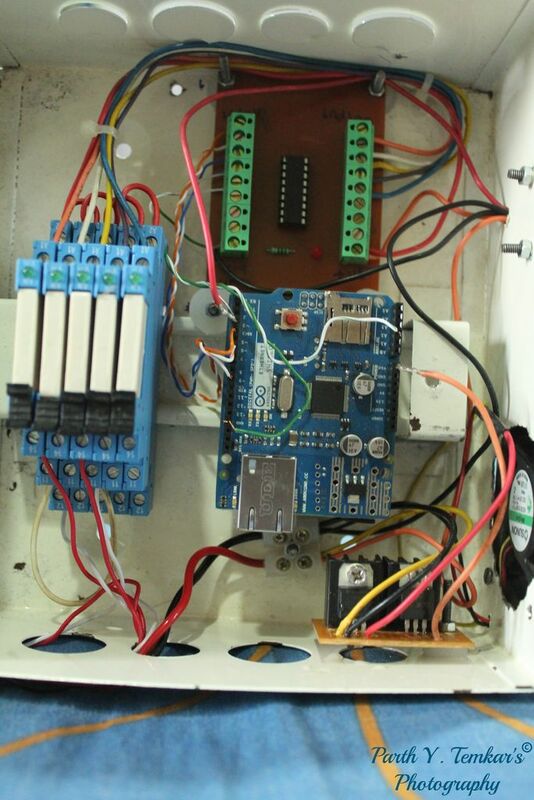 here is my 2nd instructable to build a Arduino Home Automation System. This is the First Build Using Bluetooth And the Other Is Using Ethernet. so i came up with an idea, as we teenagers always have our mobile with us. i thought of controlling all the things present in the house with our smartphone. Some Wires " I'll Suggest You To Use a SMPS Wires As They Are Good "
12V or 24V relay "I've Used 24V industrial Relays"
Then Install all The Components In The Enclosure As Per You'r Needs.. Please See The Photos To Get The Ideas. Do The Wiring As Per The Circuit Diagram Its Very Simple. Sorrry i have connected only 8 relays there is an option for 9 relays you need to add one more ULN2803. Please Watch the video to see the 2-way switch wiring, and see the photos. the only thing you need to change in the switch wiring is that instead of the 1st switch connect the relay which even has a 3 pins. I have even housed the powersupply in a smps cabin. Step 3: LETS PLAY WITH SOME SOFTWARE'S!!!!!! unzip it , and place it in the library folder. see the photos for the reference. now open the arduino IDE. go to the examples option and open the ArduinoIrRemoteMaster (or whatever You have Named It) and open IRRecevDump file and upload it on the board with the Ir receiver Connected to Pin 11. Now Watch The Video Of How to Record The Ir Code With The Explanation. Am Providing The Code With Already Ir Codes Inserted For TATASKY STB and SONY TV. Now Upload The Code With The Transmitter Pin Of The Bluetooth Module Disconnected From The Board . Once Code Is Uploaded Connect The Transmitter Pin Of Bluetooth Module To The Arduino Receive pin. Now Install The Android App On The Phone. Small Video On How To Use The App And Set Up Your Android Phone For Use With The Bluetooth Module. now till this point your code is ready your hardware is ready and even your mobile is ready. so before turning on please check the positive and negative lines weather they are in proper polarities from the power supply or not, cross check the connections and turn it on. If Everything Is Good to go the start using it. further if you want a more custom app can contact me and ill be there to help you all. sorry for late reply you can connect with me on facebook with what exactly you need help with, as i have almost specified each and everything needed to build this project. Neat idea, and well done on figuring out the complex bits. Thanks for sharing! PARTH can u send me the code on home automation. nope.. brother. the whole code change as you need to declare WiFi setup n all. then the Android app changes. i havent work on arduino before but i am planning to make this same as u made it. but i have only one trouble with it the application where to get this app0 that u are using ? send me mail. ill mail u the ap and the code if ur really intrested..
parth- i look forward to asking you questions about your auccess with toner transfer method at the meetup for IoT in Mumbai. I do have a board that I need immediately. if you can tell me the steps your followed for toner transfer, that will help me immensely. My main problem lies with the transfer not happening good enough, and the choice of paper. The laser print i get is from the local shops, is that a good idea?